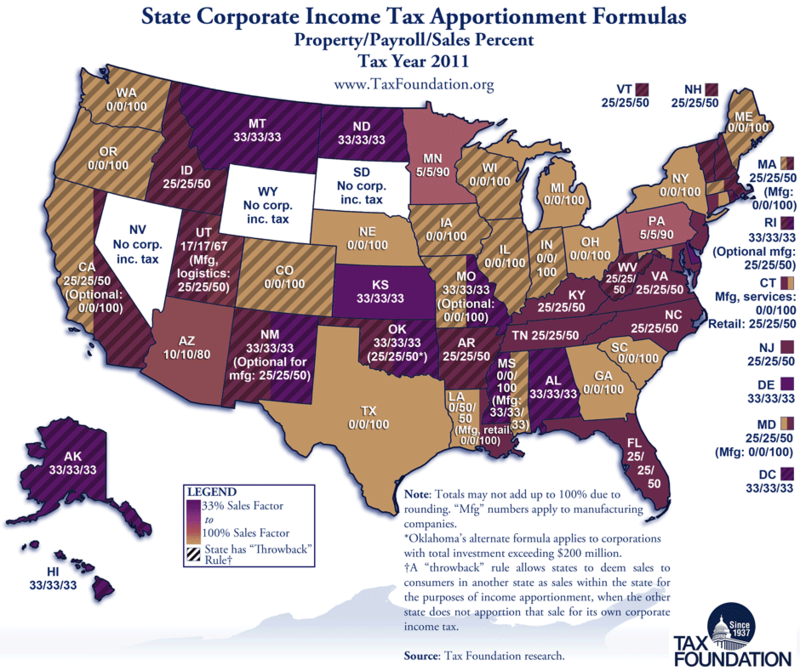 Today’s Monday Map shows state corporate income tax apportionment formulas. These formulas are used by states to determine what percentage of a corporation’s profits are taxed. Generally, three categories are used: property, payroll, and sales. As an example, consider a company whose corporate office is located in North Carolina and has the bulk of its staff living and working in North Carolina, but maintains a small sales office across the border in South Carolina. To put hard numbers on it, 90% of its property and 90% of its payroll are in North Carolina. However, half of its sales are to customers in South Carolina. 70% of the firm’s profits are subject to North Carolina’s corporate income tax. 50% of the firm’s profits are subject to South Carolina’s corporate income tax, and thus the firm gets taxed on 120% of its income. Courts have ruled that, in order for a corporation to be subject to a state’s income tax, it must have a physical presence, or “nexus,” in that state – sales on their own are not enough to create nexus. A corporation that has nexus in only one state while still selling to consumers in other states often ends up with “nowhere” income – income not taxed by any state – particularly if its home state has a sales-heavy apportionment formula. Many states have adopted what are known as “throwback” rules, which deem sales to states where the firm has no nexus as sales within the state for the purposes of apportionment, thus eliminating the problem of “nowhere” income.